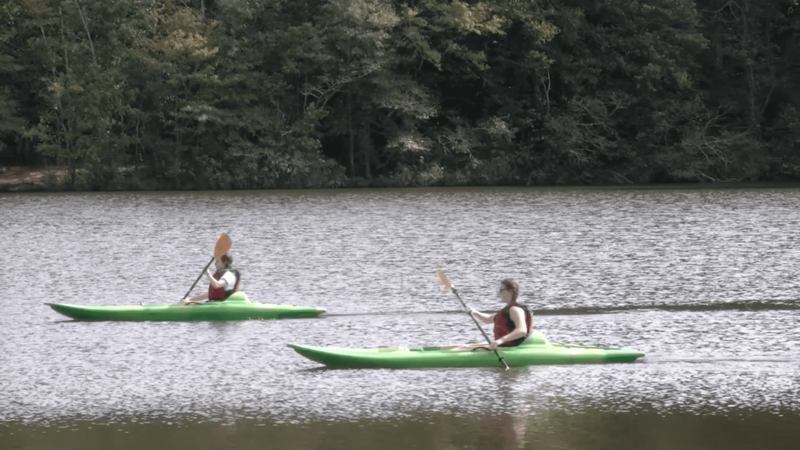 Visitors take their kayaks out on Lake Herrick for the first time. Lake Herrick opened up today to swimmers and boaters for the first time since 2002. The lake was closed then due to pollution, but it has now reopened for university research, recreation and experiential learning. Guests today were happy to walk around the lake’s new features and actually get in the water. Herrick went through two phases of restoration, first restoring the water quality and second updating the pavilion and surrounding area. At least 100 visitors were at the opening ceremony, including University of Georgia President Jere Morehead. “The restoration of Lake Herrick was a goal for so many on campus for more than a decade, and one which I made a priority shortly after I became president,” Morehead said at the ceremony. The new pavilion and lakeside lawn will provide space for community events and even UGA classes. Toxic algal blooms from pollution led to the degraded water quality of the lake, but officials say it’s safe now. Dr. Dale Green, dean of the Warnell School of Forestry and Natural Resources felt that lake users need to take care of the area by doing things like picking up after their dogs and keeping bikes on their designated trails. “Let’s all enjoy it and treat it like it’s ours, and hand it to the next generation in better shape than we found it, because that is really what sustainability is,” Green said. Sage Barnard is a senior majoring in journalism.